Seventh Group One victory for the daughter of Intikhab. 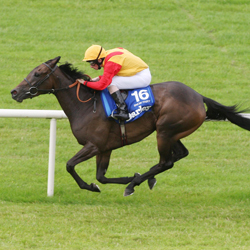 Snow Fairy wrote another chapter in her fairy tale story when she lifted the roof at Leopardstown when landing the Irish Champion stakes at Leopardstown on the 8th of September. The daughter of Intikhab scored her seventh Group 1 when beating Eclipse winner Nathaniel and Breeders’ Cup winner St Nicholas Abbey. Previous to this she showed her willingness to win when she landed the G1 Prix Jean Romanet at the Deauville meeting fighting off top-class opposition even though she had not run for nine-months. Cristina Patino’s mare showed all her familiar turn of foot to land the Darley Prix Jean Romanet on the 19th of August. Snow Fairy was badly injured after the G1 Queen Elizabeth II Commemorative Cup at Kyoto in November and her trainer Ed Dunlop showed great patience and horsemanship to get her back fit for the Jean Romanet. He said after the race “I think this is the highlight of my career, to win this today with a 5-year-old I thought was finished.